"Alas, we do not live by tango alone ... sometimes, there must also be flan." One of the delicious ironies of Argentine Tango is: The more popular it becomes, and the more people tend to gather at familiar venues, the less space everyone has to dance. Indeed, tighter conditions on the dance floor is the norm in many well known destination cities for tango  San Francisco, Montreal, Berlin  as well as in major festivals throughout the world. And the familiar expression "the crowded dance floors of Buenos Aires" highlights just how common this situation is in the city where tango was born. Closer to home, we can regularly encounter the same circumstances during the busy periods of many popular milongas  such as Milonguita Grande in Santa Barbara, or Oxygen, CalTech, El Floridita and El Encuentro down in Los Angeles. This feeling of "dancing on a crowded floor" is also quite common in any gathering where the space itself is limited or smaller in size, such as in the house milongas and cafe settings of Wednesday night's Milonga Cambiante in Santa Barbara. However, instead of being seen as a liability, this very "lack of space" is often experienced and engaged as an important facet of one of Tango's most celebrated qualities: The coming together of many different kinds of people to share and enjoy this renowned, communally-created art form. Indeed, in order to maximize their contact with each other and other members of the community, many aficionados and experienced dancers alike favor and deliberately seek out crowded Tango events. Not only do they enjoy the invigorating challenges of exploring the music on a tight floor with other skilled dancers, but they relish the "contact high" that comes from sharing and amplifying Tango's many social qualities. By way of metaphor, some of these ideas are similar to our dancing with a "school of fish"  many individuals joining together to create One Larger Being that moves and flows effortlessly, seamlessly, like a river. And for many, the sensibility and feelings involved can be profound, leading us ever deeper into that fabled state sometimes known as tango bliss. A Living Dance vs. Static Architecture = A Round Peg in a Square Hole? As newer dancers, we are often consumed with learning how to move our own bodies, how to communicate with our partners, and how to perceive and respond to elements and ideas we hear in the music. Plus, since tango is famously an improvised dance, we encounter the extra challenge of bringing these many aspects together and letting them unfold smoothly "in the moment," through time, all without a roadmap or plan. And by extension, with the entire room  the larger "school of fish" composed of even more couples  all of them improvising to the music while sharing the dance space together. Of course, without reference to some kind of guideline, the "mass improvisations" of many dancers could easily generate a chaotic or turbulent environment, perhaps similar to a boiling pot or a pinball game, where movements are randomized and collisions are more likely. Fortunately, tango has evolved several approaches and conventions to help us address the challenges involved  among the most prominent, the idea of the "Line of Dance," the imaginary pathway that describes our counter-clockwise progression around the room. In tango, this Line of Dance is called la ronda. Similar to the English word "round," ronda suggests the idea of "going around" or making a circuit around the edge of something  around the perimeter of our shared dance space. As a consequence, we lose something when we try to fit a "round peg in a square hole." With a "rounded ronda," our dance space gets significantly smaller in a rectangular room, reducing the number of dancers who can comfortably share the floor together ... and/or increasing the "pressure" on the dancers themselves by compressing and crowding them into a smaller area. 18' x 25' rectangular room. 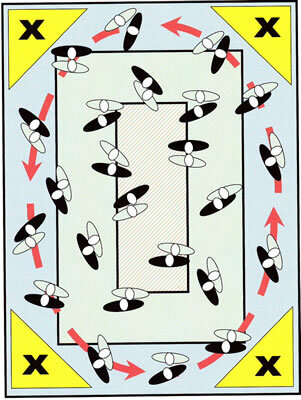 In the example above, the yellow corners represent "unused space," the loss of which can reduce everyone's room to dance by up to 25%. 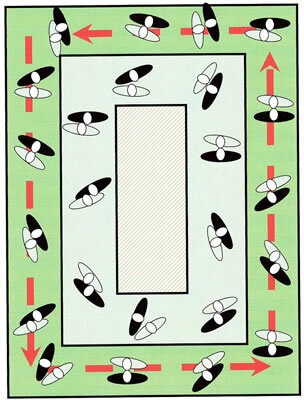 Not using the corners tends to crowd other dancers toward the middle of the floor, reducing or eliminating their room to maneuver and chance to progress, and greatly increasing the possibility of collisions. When there aren't many dancers on the floor and everyone has plenty of room to move, the ultimate shape of the dance space itself is of little consequence  by analogy, on an empty desert highway, we can drive however and wherever we want and not bother anyone. On a crowded freeway at rush hour, it is critical that we maintain our awareness of every neighboring car and driver, and that we all match our speeds, watch our distances and signal clearly in order to create the optimum flow and to avoid collisions. If any one car stalls or stops for too long, or begins to wander randomly from lane to lane  or if construction or an accident takes a lane away entirely  then even routine traffic quickly piles up and the freeway can become a parking lot. The same way that drivers on a busy freeway make use of all available lanes, and the water in a river stretches fully from bank to bank, so too in tango. On a crowded social dance floor, Argentine Tango goes around the perimeter of the room  if that room is rectangular, then the "Line of Dance" is also rectangular ... not circular. Maintain Good Lanes: Whatever its shape, the perimeter of the room describes the far edge of the "outside lane." When this lane fills up with dancers, a new/second lane forms to just the inside of the first  both continuing to follow the larger outline or contour of the dance space. If needed, additional inside lanes are also added the same way. Use All the Space: In order to create a rectangular Line of Dance, it is important that each couple use all the available space and carry their own dancing all the way into the corners. Don't Cut Corners: "Rounding off" any corner in order to make our own progress easier at the expense of others can be considered very poor form  disrespectful and disruptive to our neighbors, and the mark of a careless, unaware or unskilled dancer. Twenty-Four couples using lanes and a rectangular "Line of Dance" to share the same 18' x 25' rectangular dance floor. In this new example, everyone makes maximum use of their shared space by keeping to their lanes and dancing all the way into the corners of the floor. As a conequence, each couple here has more room to move and express themselves, there are fewer "traffic jams," and no one is boxed in or stranded in the center of the room. 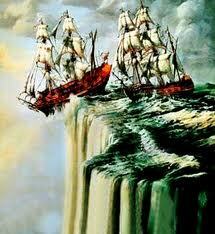 Centuries ago, many of our ancestors conceived of the world as a "flat disk" suspended under a dome of heaven, and they imagined that if sailors ventured out too far from land and wandered deep into the chartless oceans, they risked sailing off the very edge of the earth into the empty void. On a dance floor, the tango equivalent of "staying close to shore" is avoiding the edges and huddling in the middle, where there is the illusion of "plenty of room." But when all our boats cluster together and drop anchor in the same small harbor, none of us have room to raise a sail, catch a fresh wind, and point ourselves toward new ports and distant shores. We will point our tango compass directly at these far horizons by proposing several ideas aimed at taking us into the "unexplored waters" hidden in plain sight, deep within the corners of the dance floor. Along the way, we will celebrate the exceptional social nature of Argentine Tango by maximizing the space available, for both our own dancing and that of our neighbors. Background & Information on "Floor Craft"